sSo much coffee too little time. We love tasty (quaffable) coffee and there is quite a bit out there. The International Coffee Organization (ICO) has 78 registered Arabica growing countries, each of which has over half a dozen major growing regions. Multiply this by the fact that good coffee growing countries have over a dozen micro regions in those major regions, never mind the processing plants and estates, and you can see that there is a lot of coffee, and not just in Brazil as Frank said. 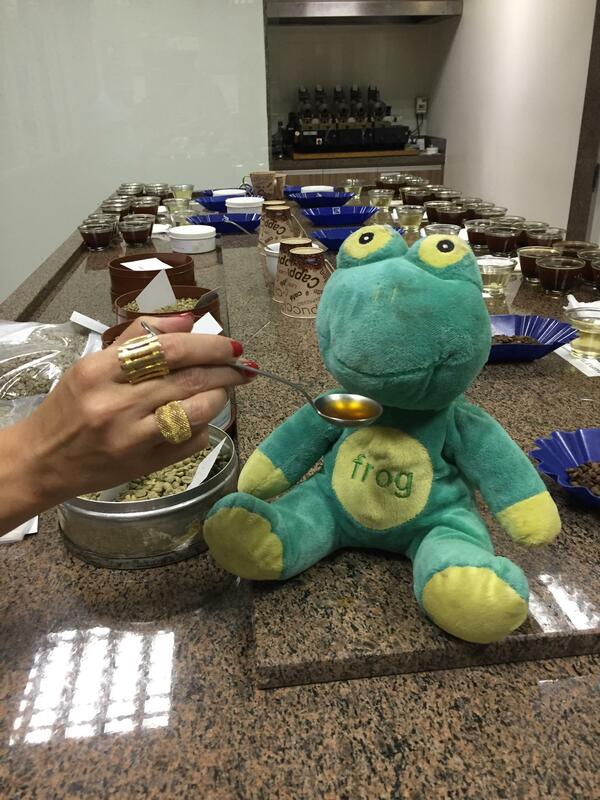 What are the considerations we ponder when we source coffee? Firstly we consider the pricing. We have found essentially 4 sections or levels of the coffee market. 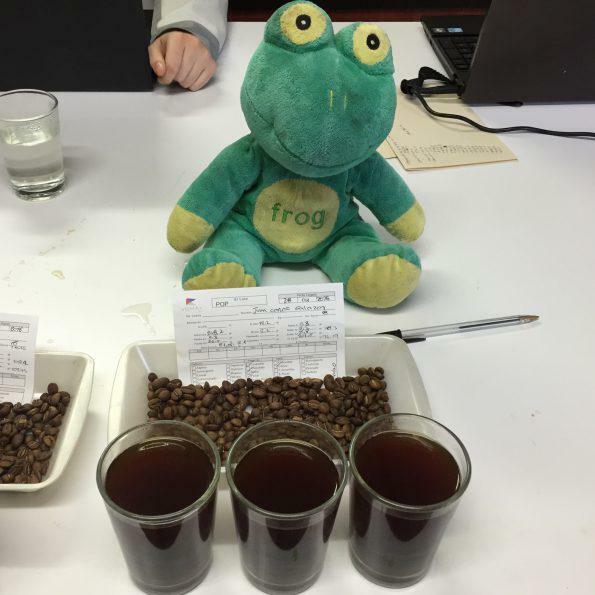 Then most importantly we taste the coffees. For that we use our senses. Price is usually a good compass when it comes to quality, especially at the entry level of any market. Basically the entry level in the Arabica coffee market is Commodity grade coffee (C-grade). C grade coffee’s price is the contracted price based on the coffee commodity futures market prices of Arabica coffee as set in New York. This price is determined by coffee futures traders, who have probably never seen a coffee tree. This trading is essentially trying to predict the volumes the producing countries (read Brazil and Vietnam) will produce in production period. Coffee sold at this level is bulk grown, bulk produced and offered in bulk. It is usually sold using simple grades of size, and price is the major indicator. 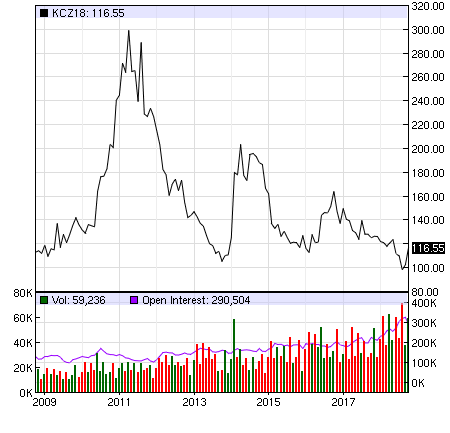 As the coffee futures market is the second most actively traded commodity futures market, it is very volatile. This is like my brother Darryl. Or the other brother Darryl. The next price level of the Arabica market is one linked to C grade, with a small price premium added. So for example there is the size premium (like AA grade, or Supremo grade, or grade 4) coffee. Or type of coffee that is regarded as premium for example SHB (strictly hard bean) or SHG (strictly highland grown). Or the certified premium like organic or fair trade. These premiums are added to coffees that are usually C grade and increase the price by a fixed amount of US Dollars. For example if you can buy standard bulk C grade coffee for $1.50 a pound (as per the futures market) then the Organic certified version of that coffee will be $.25 more per pound. This pays for the certification and whatever investment the farmer or usually co-operative, or group of co-operatives or regional co-operative has to make to get the coffee certified. We call these C grade plus coffees. The real McCoy. The next level of coffee is the first level that considers its cup quality. This is specialty grade coffee. For coffee to be make the grade the processing of the lot has to be done with care and control. These lots are usually smaller and well traced and can be identified as good scoring coffee in the cup. If they score 80% or more they are called specialty grade coffee. As the coffee gets offered to the various people in the process (normally processor, exporter, importer – although this can be skipped if the roaster is importing directly – and roaster) it is again cupped and should score at least 80% in the standard SCA cupping sheet along the way. These coffees sell for significantly more than the C grade price, and C grade plus. The premium is linked to the cup quality (at the moment a typical specialty coffee is 2 to 3 times the C grade price). The farmer – and various processors of the coffee get rewarded for producing a high quality coffee by getting paid more for what is identified in the cup. These are the rock stars of the coffee world (although better behaved). The price level is either auction or demand determined. Here the coffees are typically very small lots of coffee, and they are very well processed and cupped often. They would score at least 87 (out of 100) when cupped. The higher the score the more the coffee is in demand. Since free market forces determine the price of the coffee, whether it be on an award driven auction like the Cup of Excellence auction or a farm driven auction or an independent auction or simply by a secure limited lot control by a respected coffee producer. These 87+ coffees we usually only purchase in very limited quantities. Sometimes we are only able to access less than 100kg this is why we call them Limited coffees or Limited Reserve coffees. Mom’s cooking may have been the best you had, but the real proof in the tasting. The pricing level of coffee is a yardstick to what we taste in the coffees. We know that most of the C grade coffees are primarily designed for bulk blending, bulk automated roasting and instant coffee, so we do not even consider these coffees. Finding a ruby in the dust? Although we seldom find good C grade plus coffee, we do taste them occasionally. A main reason we do, is that now and then we dig up an acceptable option to offer at the entry level of our coffee list. This discovery allows us a way of offering a blend for those that are budget minded who still want something good. When we are offered coffee at a C grade plus price and we taste it, and it is good we call it a three star coffee. These coffees are usually from a large co-operative so traceability to farm is almost impossible. We do however require as a minimum the region of the country where the coffee is from, and some traceability. If the coffee scores at least 75% we offer it as a Single Origin (or SO) – our most regular offering like this is Sidama. We are mainly interested in the traceable coffees that are sold on quality. When we are offered these coffees we usually blind taste the coffee. Here we ignore tasting notes others may have prepared. If we are currently offering a coffee then as a reference point, we place a coffee we already know from a similar region, on the same cupping table. If we like the coffee, it will score well and we will then attempt to secure an amount of coffee from the supplier that we estimate will sustain its tastiness for the period we believe it will take us to sell that lot of coffee. This can be tricky since we cannot guess the future but we try use our past experience to determine how much of this style of coffee will sell before it starts to fade. Each coffee fades at different rates, but we have an idea from the past based on processing, packaging and the country and region of origin. We do get offered some great coffees. Typically when the lots are very small and well controlled these coffees are more than tasty they are extremely quaffable. The coffee must score 90 or over in our blind tasting. We are usually lucky to get over 100kg of this coffee. It is hard to predict how well these coffees will sell, but we limit how often we roast these since there are minimum batch sizes in all of the roasters we use. This means that sometimes people have to wait for these coffees to be roasted. Over the last 2 years we have developed a good following for these Limited and Limited Reserve coffees and we are usually able to make sure they are sold out before they start going flat. These coffees are also usually very well packed using nitrogen flushing so it is more important to sell the coffee quickly once we open each bag, which is typically between 15 and 17.5kg in weight. The coffee industry has developed many bywords, some good – some bad (in our opinion, although we are not St Nick). One of these that seems to be used by many coffee drinkers is the linking of darkness of roast to the opinion of the body of coffee. This description level is very one dimensional but it is the safety blanket of the coffee lover. Since we understand that taking a safety blanket away can cause a lot of tears, we have linked these 1 dimensional descriptions of roast level, to what we believe people are actually meaning, body or mouth feel. So when people ask for a light roast we understand that as easy drinking, medium is the same as medium and balanced and dark roast full bodied or dark. Of course when we are asked for other items we understand that each is to their own and we are not their Mommy. Said the coffee snob “I blend my own coffee”. The other common concept in coffee is that coffee needs to be a blend. Most commercial blends have 9 or more coffees in them. Hence they are typically humdrum and mostly immune to changes in coffee, which as an agricultural product, it will naturally go through. While we understand this makes it simpler to order the same blend each time, our blends are designed to be quaffable and at the same time representative of the quality of the seasonal crop of coffees in the blend. We never blend more than four coffees, and for all blends above 4 stars all the coffees in that blend will be specialty grade coffees. A blend will naturally change as the coffees in the blend are updated or change depending on the season and availability of the coffees in the blend. We do track the version of blend, typically these versions are always similar, if not better. Blended for a reason of taste and or concept. Since almost all African coffees are from a larger co-operative these are stand out coffees from Africa. 3 ★ Blend A drinkable blend of mostly 3 star single origins (as below), and typically one 4 star SO coffee that may be a little flatter than it was when we first sourced it. This coffee is pre-discounted to aim at the budget conscious business buyer. 3 ★ SO coop A C-grade plus coffee that is drinkable and traceable to the co-operative where it was processed. Has to score 75% to be offered as a part of our list. 4 ★ African A quaffable coffee that cups well and comes in premium and is traceable to the region or micro-region is comes from. 4 ★ Blend A blend of 4 star single origin coffees. 4 ★ Single These coffees are traceable to the farm and the lot they are from. These are quaffable coffees usually from smaller lots. 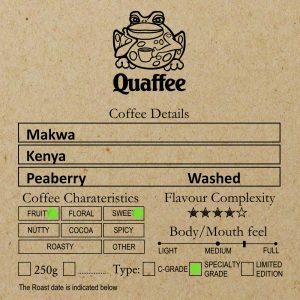 5 ★ coffees A very quaffable coffee that represents the best of a farmer / producer. These coffees produce a spectacular cup and are priced per coffee. There is no typical price point for them, rather the world-wide demand determines the price.